Copper does not react with water, but it slowly reacts with atmospheric oxygen, forming a layer of brown-black copper oxide. In contrast to the oxidation of iron by wet air, this oxide layer stops further, bulk corrosion. A green layer of verdigris (copper carbonate) can often be seen on old copper constructions. Water cooling equipment (such as water block) usually tarnishes when exposed to sulfides, which react with it to form various copper sulfides. Tarnished copper looks discouraging, but has no measurable performance impact on performance as the oxidation layer is too thin to have any effect on thermal conductivity. It is nearly impossible to avoid naturally occurring copper tarnishing (oxidation). It is recommended to use nitrite- or latex gloves during installation as human skin oils are slightly acidic. 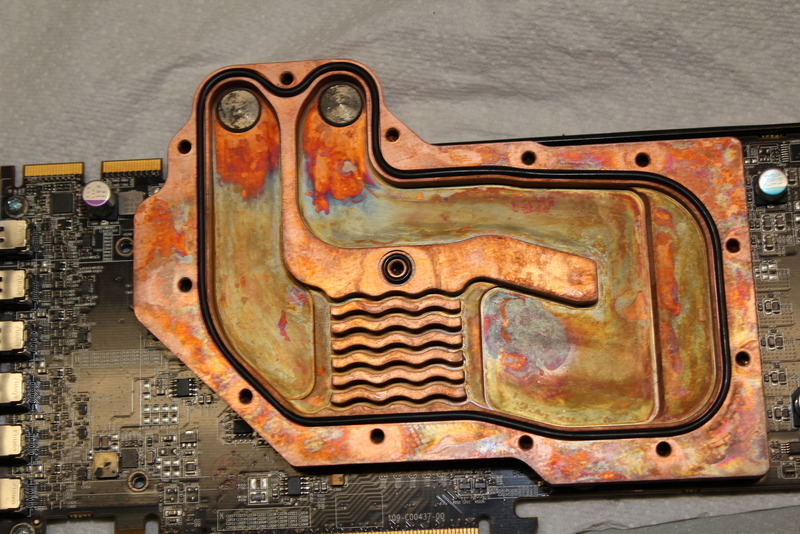 Users that do not prefer the looks of tarnished copper are advised to use nickel-plated copper water blocks. In order to prevent tarnishing on the inside of the water block channels it is highly recommended to balance the pH levels of your coolant. We discourage the use of copper (II) sulfate based coolants (common trade names are Nuke Cu and Biocide Cu) and highly recommend the use of a corrosion- and biological growth inhibiting coolants such as EK-Ekoolant or other market has proven cooling liquids.